What are we looking at? The green stuff on top are various inputs the Nerdsynth will have. Naturally, there’s MIDI in, so the Nerdsynth can be integrated in a multi-machine setup. Then, there’s the knobs on the Nerdsynth itself. Every function of the Nerdsynth will be available under a dedicated knob or (simple) key-combo. In our eyes, this is mandatory when designing a machine that you want to take on stage. Additionally, the Nerdsynth can be controlled via a PC keyboard, just like the software trackers you’re used to. This feature speed up composing with the Nerdsynth considerably. The yellow stuff in the middle is the actual Nerdsynth. There’s a sequencer device which runs (you guessed it) the main sequencer (and probably Nibbles ;) ). There’s a BIG update coming up on the sequencer, including a demo video and the sequencer driving an ATMEGATRON chip by Soulsby Synthesizers. More explanation about the sequencer will be in that post. 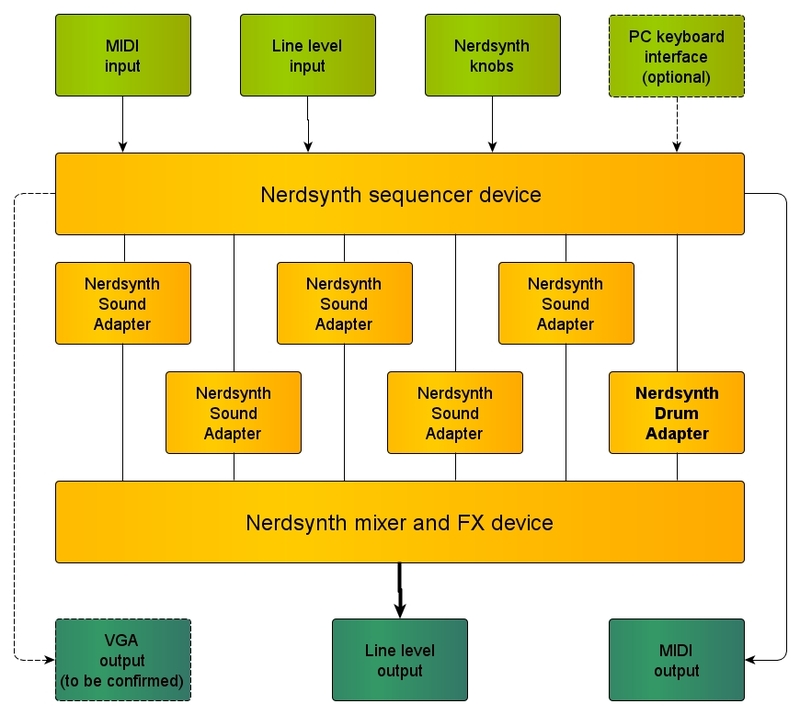 The sequencer drives a number of Nerdsynth Sound Adapters (or NSA’s as we like to call them…see what we did there?). There’s going to be room for 5 NSA’s and an NDA (or Nerdsynth Drum Adapter). The NSA’s are circuit boards that have a sound device on them. We’re working on a dedicated Nerdsynth sound chip, but we intend to add a C64 SID chip NSA, a NSA which can play back General MIDI sounds, just to name a few. Working with the NSA’s, every Nerdsynth can be configured to be exactly the music machine you need it to be. We like to dance. So the Nerdsynth needs a beat. The NDA takes care of that. With a number of pre-loaded samples of your favourite drum machines and the ability to upload your own samples to the NDA, all your wet rhythmic dreams will come true. The Nerdsynth mixer and FX device mixes the sounds from the NSA’s and the NDA and can add effects per channel or master effects. The dark green stuff on the bottom are the outputs of the Nerdsynth. There’s a line level stereo output and a MIDI output. So take two or three Nerdsynths and eexxppaandd. Or play with your mates. Last, but not least, we are looking into the possibilities to add a VGA output to the Nerdsynth. We have 2 reasons for this. Firstly, as with the PC keyboard, editing and composing is easier when working on a larger screen. Secondly, while playing live, we want to add a low res visual system that can be controlled through FX commands in the main sequencer. As we said, we’re not sure yet that we can pull this off while working within all timing restrictions, so that’s where the “to be confirmed” comes in. We’re pretty hyped about all the ideas and there are already some great steps being made to show stuff that we want to do is possible. Stay tuned, because the next few posts will be VERY interesting.